Sony PS Vita: First Impressions! The wait is finally over, for months gamers have been waiting to get their hands on the PS Vita. 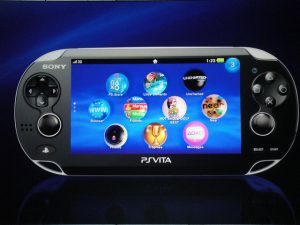 The Vita was first seen last year on E3, the graphics, the ability to start a game on the PS3 can now be finished on the Vita, but as you know when you see new systems on E3 they can change drastically within a couple of months, so everyone wants to know will the Sony PS Vita live up to the hype? Sony PS Vita dropped on Wednesday Feb 22, I was at GameStop at 10am since then I have not been able to put the system down here’s why; The graphics on the Vita are amazing playing Uncharted, Ninja Gaiden and Marvel vs Capcom look like I was playing it on the PS3. The screen is bigger than the original PSP, the Vita has a touch pad on the back which is sensitive. Being able to log in to the Play Station Network is simple if you already have a Gamer Tag you just type it in, if you don’t you can easily make one on the Vita, this allows you to purchase demos, games and play with friends online. The vita screen is pretty big, not heavy at all and if you are not used to using the Play Station Control’s they are pretty quick to adapt too. Battery life is great I’ve had the Vita on sleep mode for two days and the battery was at 60% after playing two hours of uncharted. Sony lived up to the expectation’s they gave at E3, most of the gamers I know having nothing bad to say about it, I’m an Xbox 360 girl for me to be off of the Xbox for almost two weeks that says a lot. So do I think the Sony’s PS Vita lived up to all the hype? Yes it did and is a must buy for everyone.